While Silverlight 1 and 2 concentrated on helping developers deliver rich Internet applications (RIAs), coders building line-of-business (LOB) applications had little to cheer about. The limited support for data binding and data validation complicated basic data management tasks in LOB applications. That's about to change. As announced in March at the MIX09 conference in Las Vegas, Silverlight 3 adds a host of data-oriented features that go a long way toward providing critical support for LOB development. I'll show you how to build a Silverlight 3 client that accesses a Web service to retrieve and update data. My initial version will be a form that displays a single entity. But by leveraging the new data binding and validation features in Silverlight 3, I'll illustrate how I can migrate my solution to a full-featured master-detail page in just a few minutes. If you want to try out the new features in Silverlight 3 yourself, you can download the beta here. There are two caveats that apply. First: Don't install the beta on a computer where you want to continue creating Silverlight 2 applications -- installing the beta converts Visual Studio to a Silverlight 3 development tool. Second: This is still a beta release and no "go-live" license is available. Any applications you develop at this point aren't supported by Microsoft. OK, enough warnings. For this article, I created a simple Silverlight application that interacts with a Web service on my server. 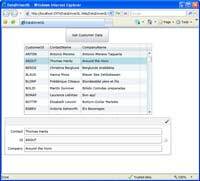 The application pulls down a collection of objects representing Customers entities in the Northwind Database and displays them in a DataForm . 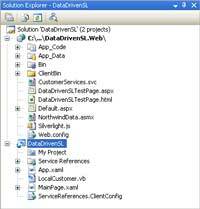 To create this application yourself, after installing the Silverlight 3 beta package, select File | New Project in Visual Studio and choose Silverlight under the language of your choice (I chose Visual Basic). From the available Templates, select Silverlight Application, enter a name for the project (I used DataDrivenSL) and click the OK button. In the New Silverlight Application dialog that appears, change the project type to ASP.NET Web Site before clicking OK. I got the solution you see in Figure 1: an ASP.NET Web Site and a Silverlight app. Figure 1. The Web site in a Silverlight solution has an HTML page and an .ASPX page, both of which host the Silverlight application that's part of the same solution. The solution is very basic at this stage and doesn't, for instance, support validating the data or calling the method on the service that handles updates. 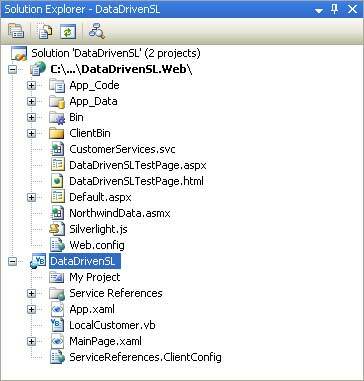 Silverlight 3 provides two ways to extend this basic solution to include those activities: extending the DataForm and extending the local object. You can alter the DataForm's behavior either by setting properties from code or, as I'll do here, by declaratively adding attributes to the DataForm's element. 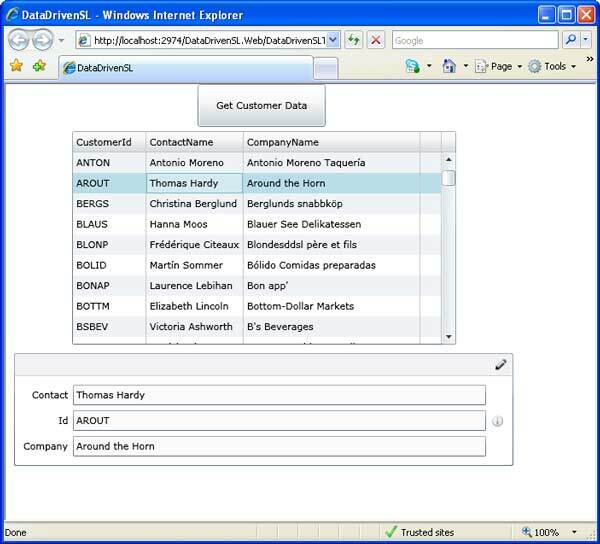 For instance, by default, the DataForm initially shows each Customer in display mode. If you set the DataForm's AutoEdit property to True, the form will automatically display each entity in edit mode when the user moves to it. AutoCommit, on the other hand, is True by default, allowing the user to save changes just by viewing the next entity in the collection. If you would prefer the user to explicitly click the auto-generated Save button to commit changes, you just need to set the AutoCommit attribute to false. The DataForm is a templated control, with separate DataTemplates for inserting, displaying, and updating data. By default, the DataForm adds a control to every template for every property on the entity. Setting the DataForm's AutoGenerateFields attribute to False suppresses that behavior, allowing you to design your own layouts for the templates. The DataForm also fires a multitude of events both before and after critical activities (such as when records are added or during validation, for example), allowing you to add code to validate data or control updates. You'll have some design decisions to make, though. Many of the items that you can control by extending the DataForm can also be controlled by extending the local object. In many cases, the best practice is to use the features of the local object to control data-related activities and limit your DataForm changes to controlling workflow. By extending the local object, your data-related changes can "follow the object" to whatever control is handling updates. While I used code to give the local object the ability to update itself, I can implement many of my data validation activities declaratively, by decorating the local object's properties. The DataForm will take all of these decorations into account when working with the property. More importantly, if I change my form and tie the local object to a different user interface control, these decorations will be used by that control also -- they "follow the object" to whatever control the property is used with. The resulting error is automatically displayed in the user interface regardless of which control is bound to the object (see Figure 2). Figure 2. When a local object throws an exception the associated message is automatically displayed at the bottom of the page and inside the DataForm. Figure 3. In this master-detail page, as the user selects a new item in the grid at the top of the page, the item is displayed in the DataForm. In real life, I would use templates in the DataGrid to have the grid display fewer properties than the DataForm. But this is where the changes that I've made to the LocalCustomer class pay off: Because my data-related code and annotations are tied to my LocalCustomer class, I can turn on editing in the DataGrid, confident that my data management code will follow the object to the DataGrid. While Silverlight 3 provides significant improvements needed to craft LOB applications, it is not a complete solution. A complete solution would provide, for instance, better control over how many objects are returned to the client and the ability to attach Attributes to the data transfer objects created at the server to eliminate the need to convert to a local object in the Silverlight client. That, however, goes beyond Silverlight and into the domain of .NET RIA Services, which integrates Silverlight with the server-side capabilities of ASP.NET (see "RIA .NET Services, for more about the framework released with the Silverlight 3 beta). When the first Silverlight community technology preview launched to much fanfare in December 2006, it carried with it a lot of promise. Despite being a somewhat limited Web media playback platform, Silverlight grabbed the attention of .NET developers keen on moving their application logic over the network to diverse client platforms. With Silverlight 3, Microsoft seems determined to win over those business developers for good. As part of the current Silverlight 3 beta, Microsoft has released .NET RIA Services, a framework that pulls together elements of ASP.NET and Silverlight to ease development of data-centric RIA applications. The RIA Services pattern lets developers write application logic to run on the mid-tier that, in a Microsoft statement, "controls access to data for queries, changes and custom operations." Bob Baker, president of MicroApplications Inc., has been working in the Silverlight 3 early adopter program. He says .NET RIA Services will change the face of Silverlight development. "This release will approach application development ease for quick line-of-business apps that rivals what we used to be able to do with Microsoft Access -- before macro security and digital signatures got in the way," he writes in an e-mail exchange. He adds that .NET RIA Services promises to eliminate what he calls "that dual, object class library thing we've been doing for a year or so." The new framework integrates client-side Silverlight components with the ASP.NET mid-tier to add critical capabilities for business applications, including data validation, authentication and roles. Brad Abrams, product unit manager of the Application Framework team at Microsoft, says RIA .NET Services grew out of the work Microsoft did on LINQ. "With RIA Services we're extending this pattern by offering a prescriptive model for exposing your domain logic over LINQ," Abrams writes. "We think of domain logic as that part of your application that is very specific to your domain -- that is the particular business problem you are solving. By following this pattern we are able to provide a number of features that help you focus on your domain logic rather than the plumbing in your code." At press time, Microsoft .NET RIA Services was in a March '09 Preview. It can be downloaded for free. But, while you're waiting for .NET RIA Services, Silverlight 3 gives you the ability to create true data-driven, line-of-business applications. And all your user needs to access your application is a Web browser.